This sweater is worked in the round with very little seaming. The tunic has side slits for ease in the hips and a cinched waist for a flattering hourglass shape. The ribbed sleeves are stretchy and have pretty belled cuffs. The off the shoulder neckline is a turned down ribbing to match the sleeves. 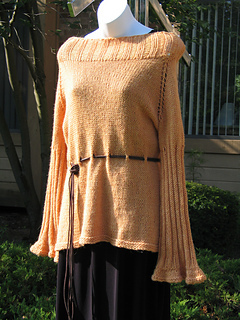 Worked up in sumptuous alpaca yarn with gorgeous, this is a simple sweater to make and a favoriate to wear.